Quickly becoming one of my favourite stamps is the blossom stem from the Indescribable Gift stamp set. I have used it so many times, it's just so pretty. I wanted to make a "spring" inspired card, for Easter. From the front, you can't tell it's for Easter since the sentiment is on the inside of the card!﻿ I call this technique "Stained Glass". Since that's what it looks like! 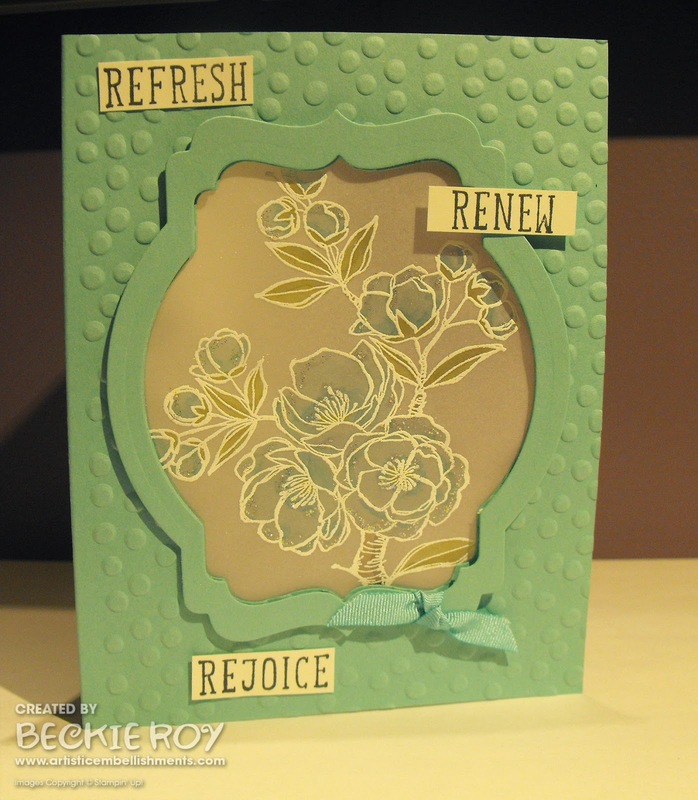 I first cut my window with the Deco Label Framelits Dies on Coastal Cabana cardstock. I then made a frame by using the same size as the window and the next larger size. 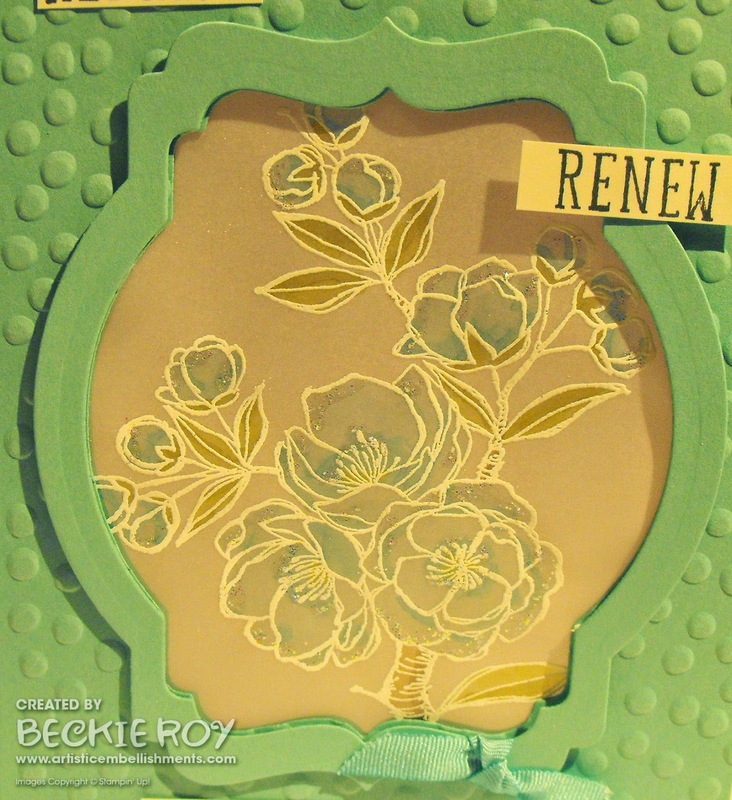 I stamped the blossom stem onto a piece of vellum cardstock and coloured the backside with Blendabilities Markers (Coastal Cabana, Crumb Cake and Old Olive). Here is a closer view of the blossoms - not too much colouring, I added a bit of darker spots to the inside of the blossoms for some depth. I did add some Dazzling Details for a bit of sparkle! I cut another piece of Coastal Cabana (4" X 5-1/4") and cut another window for the inside to make it clean and tidy. I attached my vellum piece with mini glue dots. 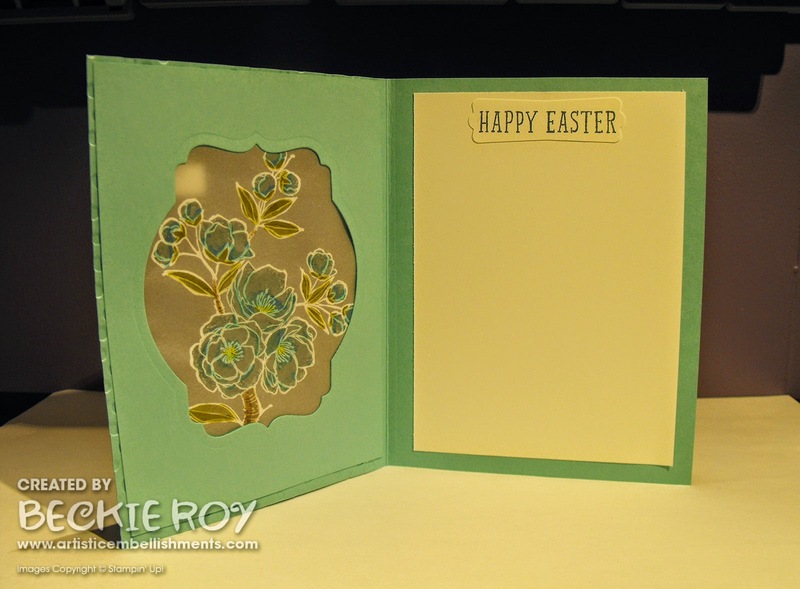 I stamped the Happy Easter sentiment and punched it out with the Modern Label Punch before attaching to my inside. I found these little letters at Dollarama, a dollar store chain we have in Canada. They were only $2 or $3 dollars. I had them sitting on one of my shelves in my craft room and then I thought, hmmm.. I wonder if I can stamp on them!? Apparently, you can. 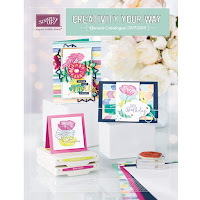 They didn't turn out perfect, because some of the powder stuck to the letters (even with the embossing buddy) - maybe it is because it's not paper? Ah well, I am still happy with how they turned out. I love this photo... how the home had a nice elongated shadow - I had to post it. 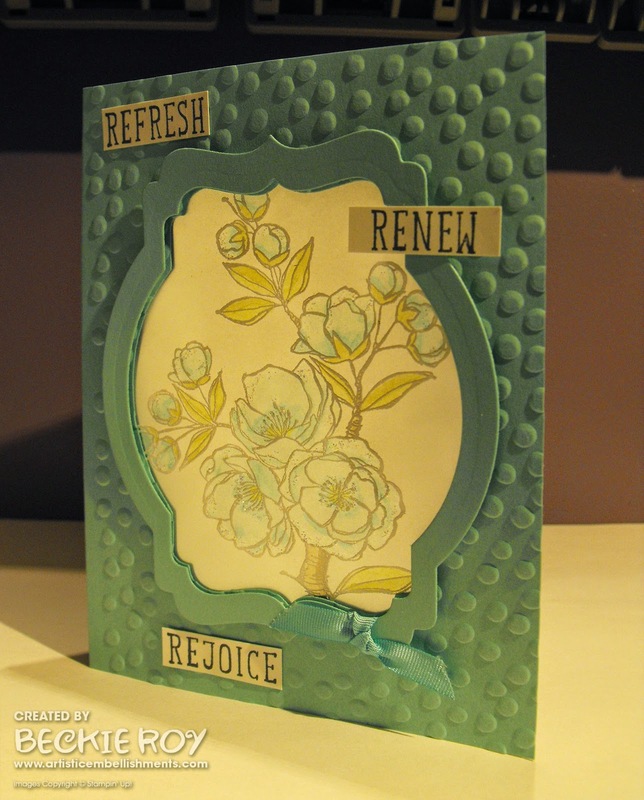 After I heat set the embossing powder, I coloured in each letter with a different assortment of Blendabilities Markers. The "H" I used Cherry Cobbler, the "O" is Pumpkin Pie the "M" is Bermuda Bay and the "E" is Daffodil Delight.